So we’ve been in the new house about 7 months now, and after all the work we’ve done inside, it’s finally time to start sprucing up the exterior. 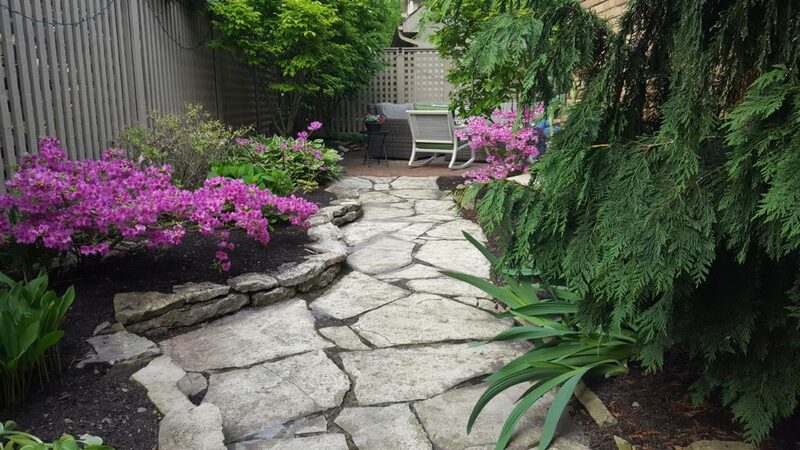 We were so excited to find this home, and the patio is one of the reasons why – it’s just the right size and it was very well designed, well built, and well maintained by the previous owner (thanks Marilyn!). But progress hasn’t been quite as rapid as we’d hoped, since this spring has been “stop and start” getting work done outside – we get a couple of nice warm days, then it’s back to winter for a while! As you can see in the first photo below, the flowers were just getting started – compare that to the photos at the end of this post! 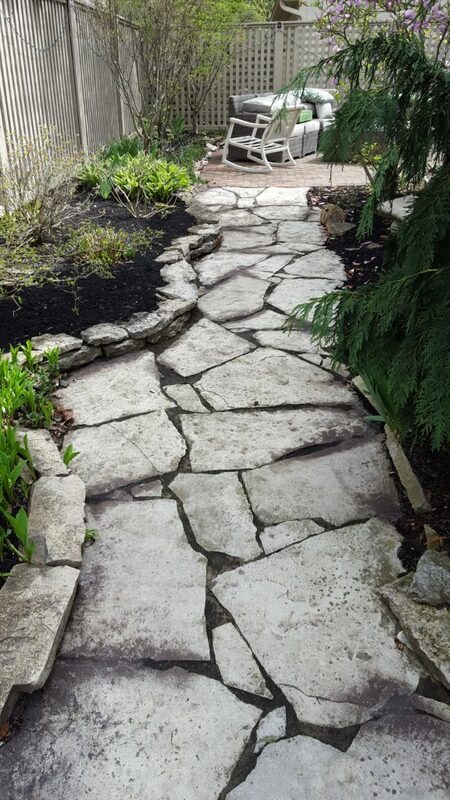 So I used a couple of those “in between” warm days to fix the loose and missing mortar between the stones on our backyard walkway. 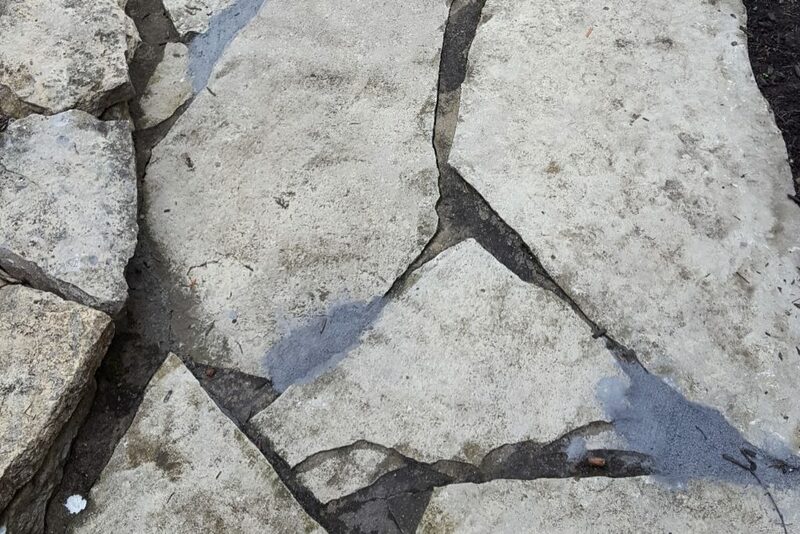 The majority of the mortar between the stones was fine, but in quite a few places the mortar had popped out, likely from the freeze-thaw cycle we endure here in central Ohio every winter. 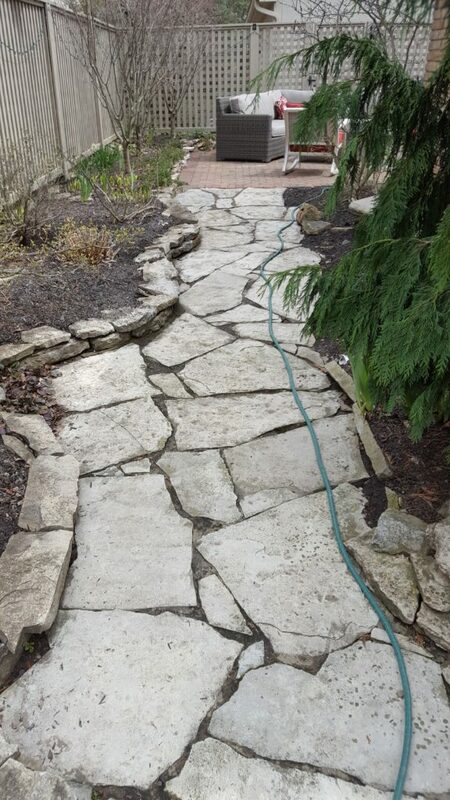 The stone walk that connects the two sides of our backyard, after power-washing. Some of the joints are missing mortar after a cold winter. I started by power-washing the whole walkway, which not only cleaned the stones, but blasted out most of the loose mortar. The rest of the loose stuff came out easily with a small garden shovel and an old screwdriver. I was a little surprised to find the mortar didn’t go very deep, only about an inch or so. That’s part of the reason a few bits popped out, I’m sure. But it’s not worth digging down to the full depth of the stones, either. With the old mortar cleaned out and all the loose stones and sand removed, it didn’t look like too big a job to place new mortar back in the joints. To keep a uniform appearance, the new mortar needed to match the color of the old as closely as possible. 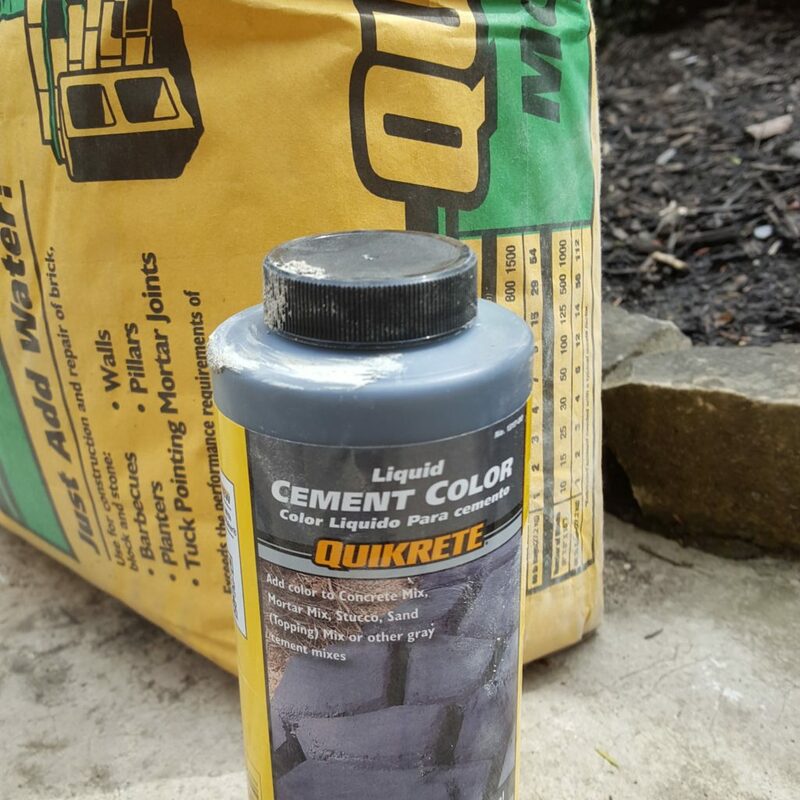 So along with a 60 pound bag of Quickcrete Mortar Mix, I picked up a 10 ounce bottle of Quickcrete Liquid Cement Color (also for coloring mortar). Because the old mortar had a dirty gray appearance, I bought the “charcoal” cement color. The instructions suggested half a bottle would color my whole bag of mortar, but I needed it to be even darker, so I ended up using half a bottle for half a bag (twice the recommended amount). So far so good. The “wet” color was quite a bit darker than the existing mortar, but like paint colors, I knew it would dry a little lighter (this is where the project started to get a tad more complicated than I’d originally imagined). After the mortar set up a little, I used a broom to sweep away the loose mortar and give the newly-filled mortar joint a rougher, more natural appearance. …but after it dried, NOT what I expected at all! What I didn’t guess is that it would dry WAY too light – the patches looked TERRIBLE! But the mortar is completely dry…now what? First, I tried rubbing in some of the cement coloring with a cloth, but that just made it totally black, which was even worse. It occurred to me however, that the old mortar was probably originally very light too, and had just gotten dirty over time. So how about making the new mortar dirty, too? 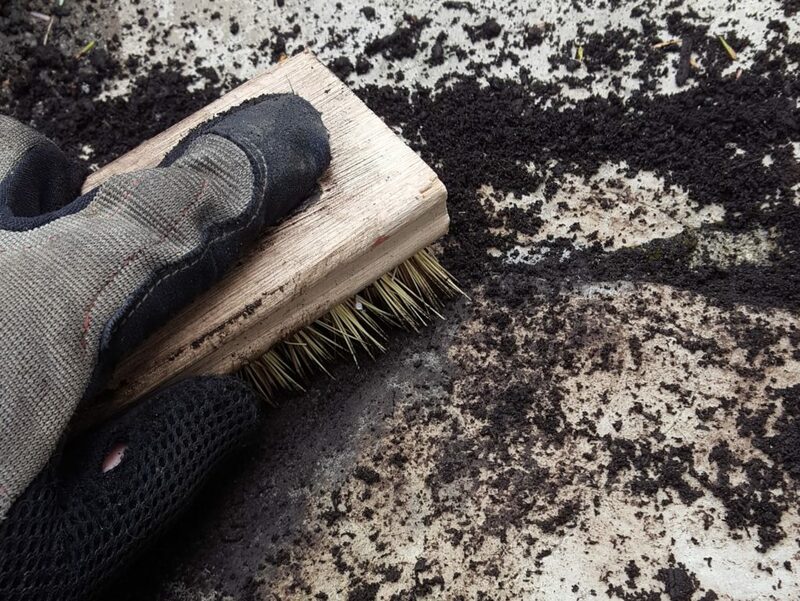 I had a bag of very dark garden soil left over from an earlier project, so with a pair of old gloves and a stiff scrub brush, I worked the dirt down into the mortar as much as possible. That was a couple of hours of work, my arms were getting numb! But at the end the mortar looked MUCH better! 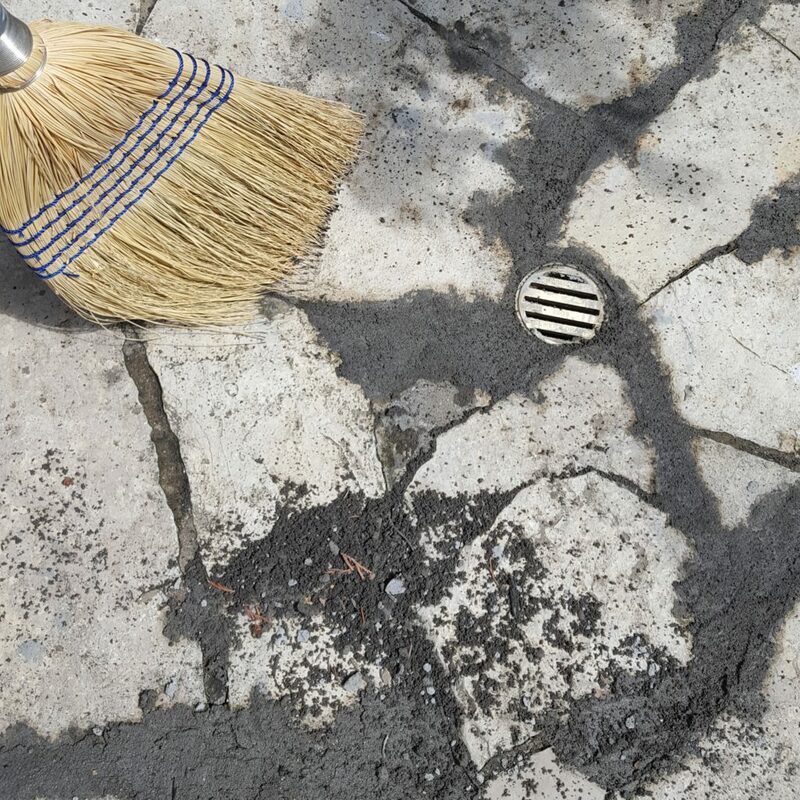 I swept off the loose dirt when I was done, but didn’t wash the stones yet – I thought I’d wait until the next rain, give the mortar time to “soak in” the dirt for a few days. Rain is predicted for this evening and tomorrow, so we’ll know soon whether the “dirty” plan worked. Update! 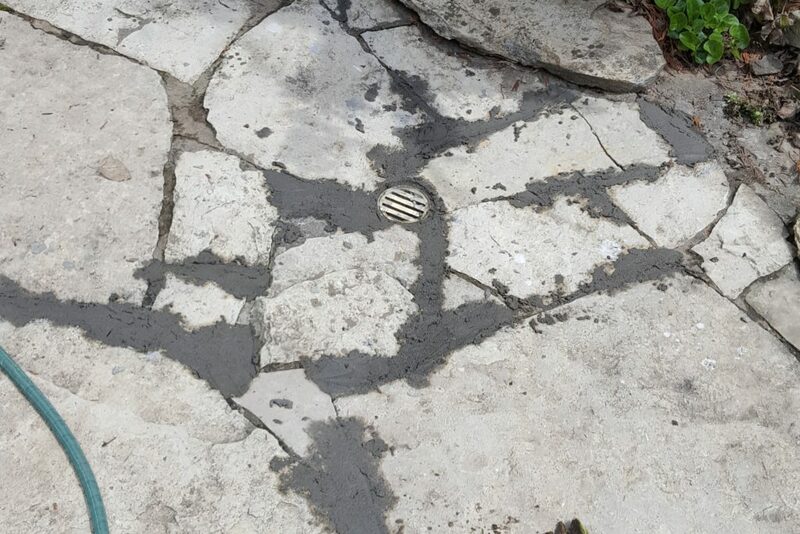 This week we had a couple of good soaking rains, washing the loose dirt from the new mortar joints. The photo above was taken after things dried out, and if you compare it to the first picture in this post, I think you’ll agree that this project was (finally) a success. Another update! 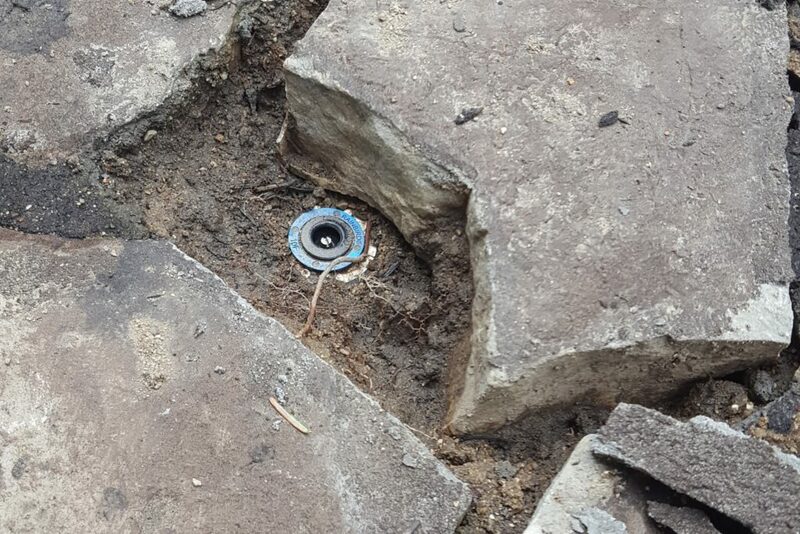 Our sprinkler guy came today and noticed what he thought was a leak under one of the stones…turns out it wasn’t a leak at all, it was another sprinkler head! How it came to be under the stone, and never noticed by previous owners of the house…well, guess I’m not quite done fixing the walkway!! 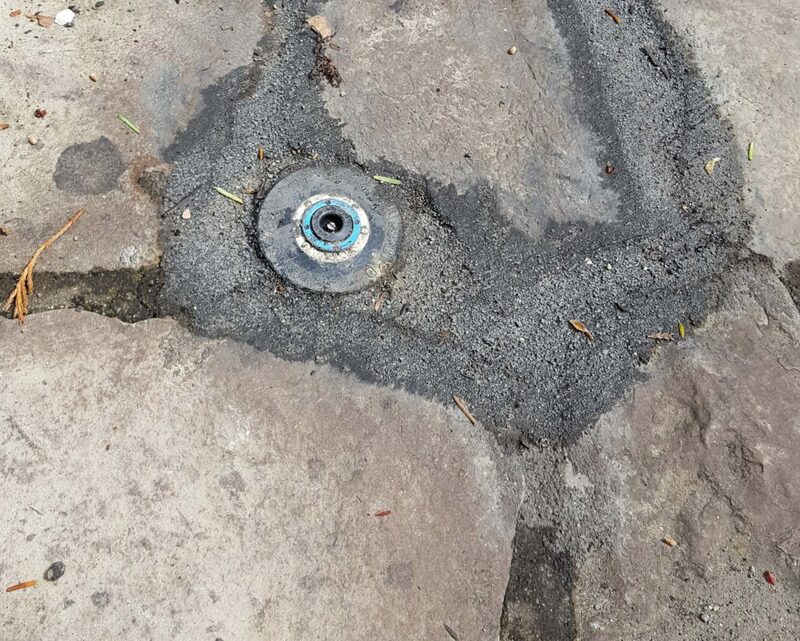 Sprinkler head buried under the stone walkway! The uncovered sprinkler head after mortaring – I used more color in the mortar this time, but it’s still not a good match. Time to get dirty again! 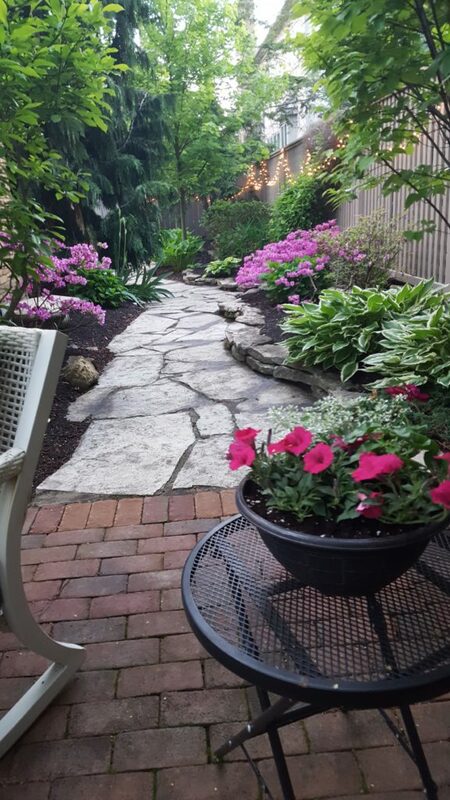 Finally, the walk is done (see the two views below), the planting beds are mulched, (and just in time – once it warmed up outside the hostas exploded), and we’re enjoying our “new” patio! We’ll be out here every chance we get, wine glass in hand!